For questions that require a confirmation of Yes or No, you can use the Yes/No field. This adds one checkbox that the user either checks for Yes, or leaves blank for No. To add a Yes/No Field to your form, simply click the Yes/No button under Available Fields section, or click and drag it into the desired location in your form. Set it as a Required field (adds a red asterisk next to the Label). 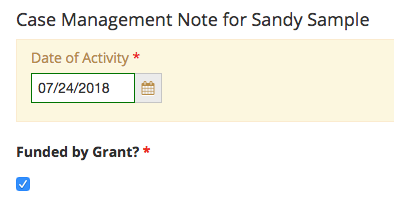 When filling out a form for a contact or group with a Yes/No field, it will appear as below. If the answer to the label is true, then check the box. If it is not true, leave the box unselected. When viewing the form result, if the box was selected, the field will show the value true. If the box was not selected, the value will be false.